Quaint and Quirky: Do I have a Problem? When I went to put away the container of Nutella I bought the other day, I came to the realization that I might have a problem. Do you think I have a problem? I like it best as filling in a crepe when it's warm and gooey. That's so funny! My most favorite way to eat it is spread on a fresh slice of french bread....the soft squishy bread is just the perfect addition. Of course I'm also a big fan of the spoon method. ;) I know of a family that has three girls, and they (and their mom) go through a tub of it every week!! My mom used to sneak bites of it on saltines, so that's how I like it best, too. Yum. I usually spread mine on wheat toast and slice up half a banana. Sometimes this is called breakfast. The breakfast of champions. Is the problem that you love collecting jars? I'm afraid I don't know if you have a problem or not because I've never tasted it. I don't even know exactly what it is, but I'm assuming it must be good if you have that many jars of it to stack them up like that. LOL Hmmm, maybe I should try some! LOL guys! 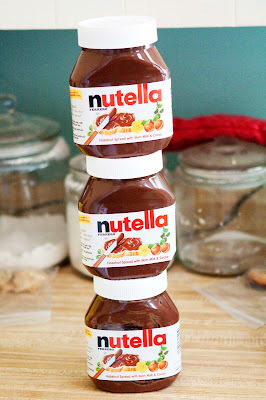 Thanks for all the new Nutella possibilities. And Debra, try some! It's a delicious blend of chocolate and hazelnut!